The crew agrees to help Iris find Bea with some help from the Peacemakers, but things take a turn. Artist Dan Dos Santos' signature on the cover art of this issue is on a label on a packing crate being kicked apart by River. 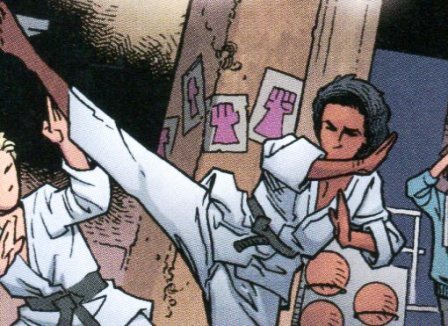 On page 4, some page-size posters of a stylized fist are seen hanging in the background of the Peacemakers' training room. The fist appears similar to the resistance posters seen in "Leaves on the Wind" Part 1 except that the markings of the flag of the Independent Planets is missing. A handbill that looks more like the resistance one is seen on an alleyway wall on page 16. On page 6, a large screen behind Mericourt appears to depict the worlds of the 'Verse. 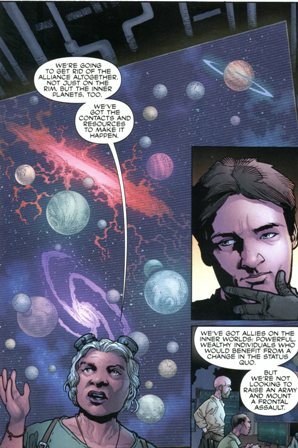 On page 8, Mal argues with Simon about the loss of innocent lives in war, bringing up his homeworld of Shadow and Fiddler's Green, a moon of the gas giant Elphame. At the general store on page 10, one of the patrons is wearing a chullo cap like Jayne's. On page 11, panel 3, there is a partially-obscured McDonald's logo behind Jayne. On page 12, panel 2, there is an advertising sign in the general store with a picture of what appears to be Santa Claus' face. Santa, of course, is the folkloric figure who brings gifts to children around the world on Christmas Eve. Maybe he brings gifts to children through the 'Verse now? Also on page 12, Simon makes the same mistake of talking in front of Kaylee about how many more choices in things he had back on his homeworld of Osiris, just like he did in "No Power in the 'Verse" Part 1, and she interprets it as him wishing he had the choice of a better class of woman than her. Of course, this seems to be more a problem of her own feeling of self-worth than a problem of his. Jayne receives a knitted sweater from his mother. The colors are the same as his chullo cap. In panel 1 of page 14, notice that his name is written on the inside tag under the collar. In panel 2 of page 14, an advertising sign for Epson is seen on the checkout counter of the general store. Possibly, this refers to Epson, a manufacturer of computer printers and imaging equipment. 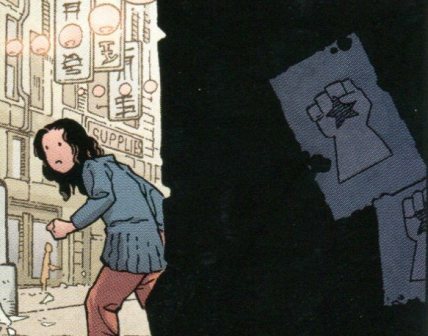 In panel 3 of page 14, a paper on the bulletin board of the general store has the top silhouette of a Firefly-class freighter on it. On page 15, panel 4, the Blue Sun logo is seen on something that looks like an ice cream freezer in the general store. This issue reintroduces Kalista, an Operative previously seen in the "Leaves on the Wind" mini-series. 8/5 Mal says gou shi Gou shi is the Chinese word for "crap"